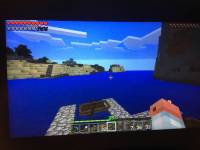 I experience several glitches on the latest versions of MCPE on the nVidia Shield Portable. I have the latest updates - MCPE as well as Firmware of the device. The sky and clouds gets cut at a fixed distance and behind that distance the sky is just white down to the horizon. This issue only happens when I have set fancy sky to on. If I deactivate the sky I can't see clouds and the error isn't there too.